It was a Wednesday evening that started out like any other but everything changed in one spin for long-time Lincoln Casino slots player Annie G when she hit the jackpot on the Crazy Cherry three-reel slot from WGS. She won the game's maximum payout and won $15,000 on that one amazing spin. Wagering a $3.00 coin and playing the maximum five coins Annie was having a pretty average evening until the Crazy Cherry symbols appeared across the three reels on the machine’s single horizontal pay-line. 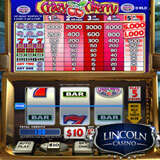 Crazy Cherry is one of sixteen three reel slots games in Lincoln Casino’s mobile casino along with twenty-eight five reel games, assorted video-poker, Blackjack and Roulette. Players can claim a 200% bonus that includes 100 free spins on the popular Funky Chicken slot game by using coupon code CHICKENSPINS when they deposit.